Hospice of the Red River Valley has named Tracee Capron, RN, BS Edu., MAOL, as its new executive director. 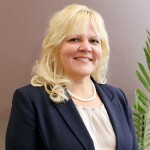 Most recently, Capron served as vice president of care innovations at Community Hospice in Ohio, where she worked to develop community partnerships and implemented consultative services in the health care community, hospitals and nursing homes. Capron holds a master’s degree in organizational leadership, and undergraduate degrees in nursing and education.